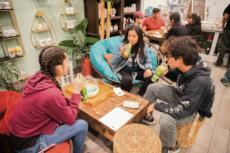 Reagan Lee | Banner | Stacy Turner, Cherishann Diamzon, and Jason Watkins, freshman film majors at La Sierra Universtiy, enjoy their blended boba smoothies at Roasting Water Coffee Shop in Riverside, Calif. 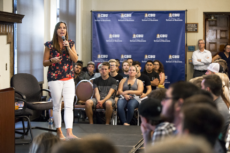 The coffee joint is a popular hangout spot for college students in the area. 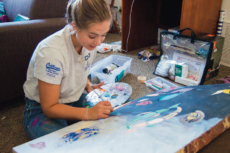 Danielle Lutjens | The Banner | Natalie Codding, sophomore graphic design major, said she likes to unwind by painting one-of-a-kind murals to display in her dorm. Kelsie Stevens | The Banner Marc Weniger, associate professor in the school of business, discusses the possibilities of have a double major in business.